If you breathe...It will find you. The list of 10,000 names was created for maximum devastation. Business leaders, housewives, politicians, celebrities, janitors, children. None of them is aware of what is about to happen—but all will be part of the most frightening brand of warfare the world has ever known. The germ—an advanced form of the Ebola virus—has been genetically engineered to infect only those people whose DNA matches the codes embedded within it. Those whose DNA is not a match simply catch a cold. But those who are a match experience a far worse fate. Within days, their internal organs liquify. Death is the only escape. The release of the virus will usher in a new era of power where countries are left without defense. Where a single person—or millions—could be killed with perfect accuracy and zero collateral damage. Where your own DNA works against you. The time isn't coming. It is now. Pray the assassins get you first. 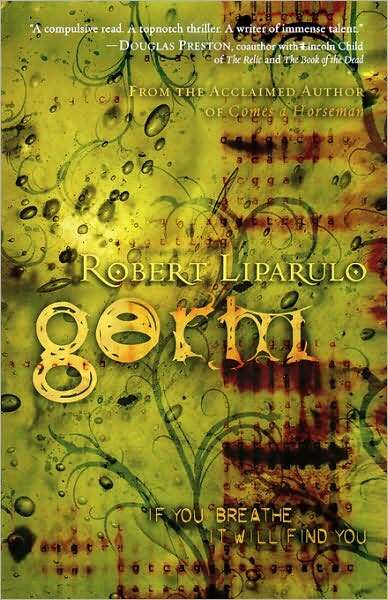 When I came across Germ by Robert Liparulo, I was initially excited to see it featured the Ebola virus used in germ warfare. That premise alone made me anxious to read it. Once the concept that the virus was modified, encoded, to attack the specific DNA of individuals was introduced in the "Facts" section at the beginning of the novel, I was hooked. In Germ, special agent Julia Matheson must figure out what is happening and why she and Dr. Allen Parker are being targeted by assassins before the deadly weaponized infection is released to ten thousand people. While it would appear that the premise would be enough to keep readers interested in the plot, the short chapters and switching to the view point of multiple characters made this novel feel choppy. Additionally, the number of gun fights, chase scenes, hand-to-hand combat, narrow escapes, etc., could have been edited down. This would have tightened up the novel and helped the pacing. As difficult as it seems, I was becoming bored with the sheer overwhelming number of fight scenes. There is no "who done it" mystery to solve, so the main suspense is in asking what will happen next. The action scenes are the star of the novel, with the Ebola virus taking a back seat to it. Ebola is horrific enough that I will admit to being a bit disappointed that it didn't take a more prominent place in the action throughout the novel. This is Christian fiction, but I don't think that that really matters at all except for the lack of colorful language. There really are not pages of theological discussions. One character is a minister and there were a few Biblical quotes, but that's about it. All in all, it was okay for a thriller (but not so much for a virus novel). Hardly resembling a man anymore, the thing on the bed jerked and thrashed like a nocturnal creature dragged into the light of day. His eyes had filled with blood and rolled back into his head, so only crimson orbs glared out from behind swollen, bleeding lids. Black flecks stained his lips, curled back from canted teeth and blistered gums. Blood poured from nostrils, ears, fingernails. Flung from the convulsing body, it streaked up curtains and walls and streamed into dark pools on the tile floor. Despesorio Vero, clad in a white lab coat, leaned over the body, pushing an intratrachael tube down the patient's throat; his fingers were slick on the instrument. He snapped his head away from the crimson mist that marked each gasp and cough. His nostrils burned from the acidic tang of the sludge. He caught sight of greasy black mucus streaking the blood and tightened his lips. Having immersed his hands in innumerable body cavities—of the living and the dead—few things the human body could do or produce repulsed him. But this . . . He found himself at once steeling his stomach against the urge to expel his lunch and narrowing his attention to the mechanics of saving this man's life. Around him, patients writhed on their beds. They howled in horror and strained against their bonds. Vero ached for them, feeling more sorrow for them than he felt for the dying man; at least his anguish would end soon. For the others, this scene would play over and over in their minds—every time an organ cramped in pain; when the fever pushed beads of perspiration, then blood, through their pores; and later, during brief moments of lucidity. The body under him abruptly leaped into an explosive arch. Then it landed heavily and was still. One hand on the intratrachael tube, the other gripping the man's shoulder, Vero thought mercy had finally come—until he noticed the patient's skin quivering from head to toe. The man's head rotated slowly on its neck to rest those pupil-less eyes on the doctor. With stuttering movements, as if a battle of fierce wills raged inside, the eyes rolled into their normal position. The cocoa irises were difficult to distinguish from the crimson sclera. For one nightmarish moment, Vero looked into those eyes. Gone were the insanity of a diseased brain and the madness that accompanies great pain. Deep in those bottomless eyes, he saw something much worse. He saw the man within. A man who fully realized his circumstances, who understood with torturous clarity that his organs were liquefying and pouring out of his body. In those eyes, Vero saw a man who was pleading, pleading . . . The skin on the patient's face began to split open. As a gurgling scream filled the ward, Vero turned, an order on his lips. But the nurses and assistants had fled. He saw a figure in the doorway at the far end of the room. "Help me!" he called. "Morphine! On that cart . . .
"The man in the doorway would not help. Karl Litt. He had caused this pain, this death. Of course he would not help.